Enabling you to gain your UK CAA PfCO and qualify as a Commercial Drone Pilot in a fraction of the time taken with our competitors in one training location. We can submit your PfCO application to the CAA on the day you leave the course. Complete your CAA online PfCO application on the last day of the course with help. Train, test, sleep, eat & socialise in one place with your fellow students / instructors. PfCO CAA Operations Manual Completion Workshop. Practice flying on site in 1 of 3 flying areas - plenty of space. Free workshops throughout course - Drone Deploy, Aerial Survey, Litchi, 360 pano, Video Editing. Instructor available untill 11pm each evening to deal with study queries / questions. Below: pics of CDT student communal area in the accommodation block and student double ensuite room with view of flying area. 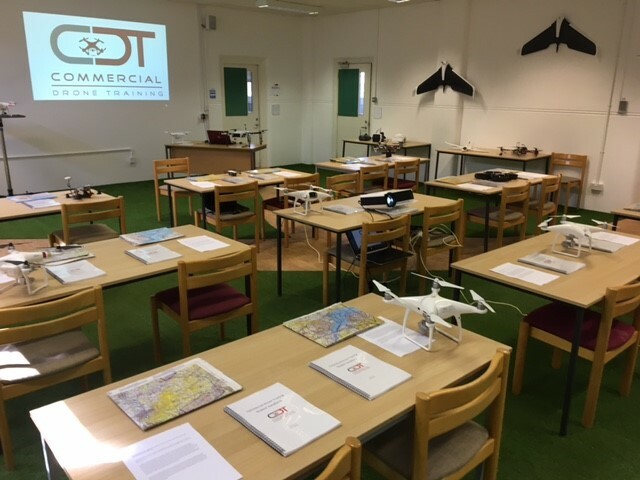 Having worked as drone instructors, flight examiners for existing NQEs & Ops manual technical authors we have spoken to a large proportion of the newly qualified drone operators coming through the existing system. The feedback given has enabled us to create a course that helps today's new commercial drone operator in basic areas such as website production, video editing, photography techniques, showreel production and more advanced areas such as aerial survey techniques. Flexibility is our strong point, having a large country estate on our hands and surrounding farmland with a diverse set of buildings and landscapes and access to interesting sites we are happy to discuss any non standard training requirements you may have such as emergency services thermal imaging, search & rescue and drone security patrols. CDT also own a large amount of DJI drone equipment and we actively encourage you to test our different machines, helping you purchase any future drones as an informed choice , rather than guess work, possibly saving you a fortune in purchasing the wrong equipment. Please contact me direct on 01626 911 012 or 07889 767 398 or email me on info@commercialdronetraining.co.uk to discuss your requirements or book online. I hope to personally welcome you on our next training course were you can get excellent training at value for money. Please remember to tell us of any non standard training requirements. The student may only resit after a debriefing and study plan is drawn up by the instructor. If a student fails on the first attempt on day two of the course, he / she may re-sit on day 3, 4 or 5. The student may only re-take a flight test after a debriefing and action plan is drawn up by the instructor. A third flight test resit is £150. UK CAA PfCO initial application fees presently payable direct to the CAA are currently £253. Insurance will be required to undertake drone activities and your flight test using your drone on our 92 acre estate. Please email us if you require any advice on insurance cover.